Fruitless Pursuits: America's Got Talent Quarterfinal Recap: A Close Call! This is the guy who plays a massive guitar / violin type string instrument that stretches across the room. He performed Love, Reign O'er Me by The Who, which is a huge and intense song on it's own, but felt even bigger with this instrument. Plus there was a crazy dude singing and girls holding spinning drums that aren't as amazing as the big string instrument, but complimented it very well. The whole performance has this weird and gritty, artsy feel to it, and I love it. 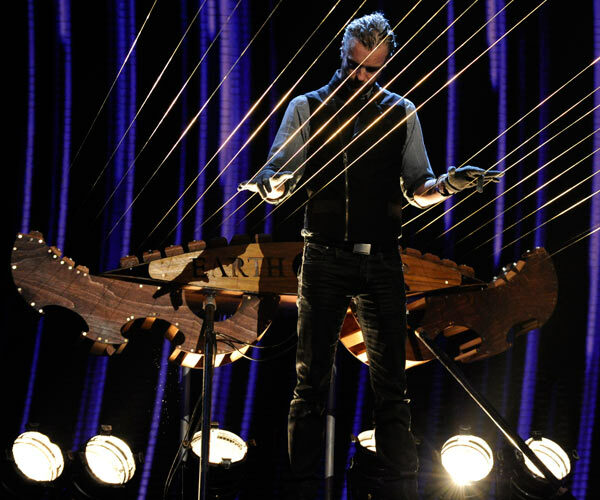 I think William Close will win, or at least be in the top 2 of this entire competition. His entire act is about getting kicked in the balls. Tonight it was more than just his usual running around and inflicting hilarious pain on himself… they added a superhero storyline to it, and took it to a new level of entertainment. Although it hurts to watch it, I love it and want to see him go through. Wow, she just gave Unity In Motion a run for their money, all by herself. I think she's even giving Turf a run for his money (if she makes it through). It's her quirky dorkiness that gives her the character to compare with Turf, but it doesn't show in her performance, only before and after. But during the peformance, you can't look away. There was a weird robot walk in the middle that I've never seen before, and had to rematch a few times. A group of dogs that can challenge the best dancers in the competition. They can pose and jump and flip just like everyone else. I don't think it was as impressive as their previous performances though. There was a big centerpiece chase joke that lingered too long, and a lot of dogs going down a slide, which is not nearly as entertaining as the flips and tricks. I'm still sure they'll go through. A human cannonball. Pretty awesome "Gonzo The Great" style theatrics, but it's definitely limited. Where can he do it? State Fairs? I would definitely watch, but it's over 5 seconds after it starts. It was great, but I'm still wanting more. With apps and games that simulate this everyday, I want to see him catch things in the air. A dozen or so guys tap dancing / clogging away, and it's unique but not that exciting. Maybe it was the country song that played along, or just that I've seen people do the same thing while playing guitar and singing all at once… but I'm not feeling it. And as the judges said, the competition is tight. He's a singer with a big grey fro, which from halfway across the room I thought it was real. He had a big performance of the bandstand song. Howard was on a mission to remove him from the show, but all 3 judges agreed and X'd him. I wish it was weirder and better. He's a very young mariachi singer with a wonderful arm. Did you see him throw that rose to Sharon? It was perfect! He should become a mariachi singing baseball player. All kidding aside, he's great. My favorite little kid singer out of the group, but I don't know how he can beat some of the others. A light and sand artist who makes art with sand and light. Sounds absolutely boring, but it's unbelievable. He made an assortment of animals that were flawless with a positive message. It's not as edgy as the public will want, but damn it was flawless. If he goes through, he won't beat David Garibaldi's cool factor. I have this big lack of trust for magicians / mind readers / etc.. I know there is a trick involved and there is nothing supernatural going on. He did a Deal Or No Deal trick where he knew which box Howie would pick. The judges were blown away, and I'm sure most of America was, but watching this on YouTube with the ability to rewind, you can re-watch the parts that look a little flubbed. He flips the case over to change what is inside, and it's extremely obvious that he's not reading anyone's mind. (why didn't the box just have the numbers on both sides?) That being said, I kind of want to see him back because I love watching him perform. 7 girls that twist and turn themselves into an artistic form of dance. It's very elegant and extremely impressive. I'm not as into the flips and spins, but when they create formations on the stage, it's better than anything else we've seen like it. I'm so torn on these two. I think they work well in an intimate setting, but this big stage performance just highlighted how much they clash with each other. He looks like a regular guy with an acoustic guitar, and she's this stiff formal singer with a great voice. Together, it's a bit awkward. She needs to loosen up a little, or he needs to split. My favorites were William Close and The Olathe Dogs. I loved the creativity behind Closes’ huge and unique instrument and it’s one he can actually play! This is musicality at its finest. I also thought the Olathe Dogs had to be the cutest most adorable little guys I’ve ever seen. I especially love seeing them hop around! I watch this show every week, thanks to the suggestion of a Dish coworker. What I love especially is the fact that I don’t even have to worry about setting up timers and I don’t have to be home when this show is on, my Hopper takes car of it for me! With the Prime Time Anytime feature my Whole Home DVR records all shows on major networks that are on during prime time. This saves me a ton of time and I don’t miss my favorite show.